Looking for a smart way to save on your home heating and cooling bills? Today, Honeywell unveiled its sleek new Lyric thermostat, a new WiFi enabled smart home device that automatically runs your home furnace or air conditioner at the perfect temperature when you’re home – and only when you’re home. Like other smart thermostats, you can control your home’s temperature manually via a dial or remotely using an app on your smartphone. The cool new feature here is a geofencing mode that allows you to set your heater or AC to come out of energy-saving mode only when you’re a certain distance from home, making sure its the perfect temperature the moment you arrive. And, if you forget to adjust the thermostat when you leave, that same geofencing will know when you've left home and kick into energy-saving mode. It's all automatic; perfect for those of us who travel a lot or have inconsistent schedules. A new Fine Tune feature, meanwhile, takes your home’s humidity and outdoor conditions into account to make small adjustments to its operation. It ensures that a cooling setting of 72 degrees feels consistent regardless of how muggy it is outside. 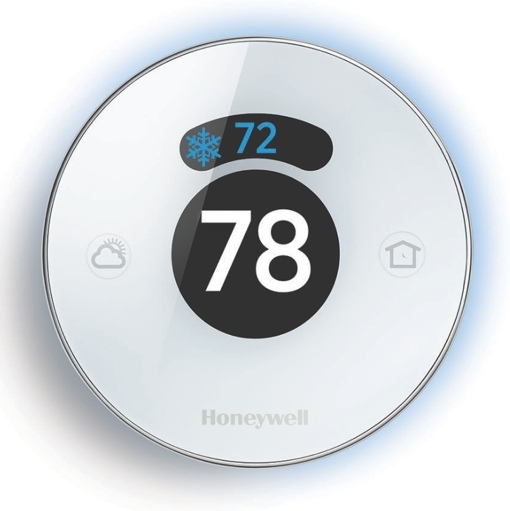 Honeywell’s Lyric smart thermostat goes on sale this August with a MSRP of $279. You can learn more about the device by visiting the Lyric website at www.lyric.honeywell.com.